After completing a brief tour of the state last week touting stopgap funding measures for K-12 education and other essential state services, Gov. Bruce Rauner reportedly compared some Chicago Public Schools to “crumbling prisons." The comment was made during a Monday press conference at Chicago’s 1871 tech incubator, according to the Chicago Sun-Times. "The simple fact is that when you look objectively at the state of Chicago Public Schools, many of them are inadequate," Rauner said. "Many of them are woeful, and some are just tragic. Many of them are basically almost crumbling prisons. They're not a place a young person should be educated." CPS in a statement Monday called Rauner's comments "disrespectful and beneath his office" and called for an apology. How Will the Budget Impasse Continue to Affect Illinois? "In Chicago, our students' remarkable achievements- in their graduation rate, in their ACT scores, in their college enrollment, in elementary reading and math- have come because of their hard work, and they deserve our support. Instead, their own governor is bad-mouthing them, de-funding them and demeaning everything that they have accomplished," the statement read. "We call on the governor to apologize for his hurtful, divisive and inflammatory rhetoric- and just as importantly, to stop being an obstacle to badly needed education funding reform." Nevertheless, during the stop at 1871, Rauner also outlined his plan to change the funding formula. Rauner claimed that the effort to accomplish such measures has been affected by Democrats’ unwillingness to stand up to powerful House Speaker Mike Madigan. During his Monday speech, Rauner also faulted Emanuel for “kicking the can, borrowing." Mayor Rahm Emanuel, who toured 1871 seperately on Monday, rebuffed the claims, comparing the governor’s rhetoric to that of likely Republican presidential nominee Donald Trump. Superintendents from 15 Illinois school districts urged Rauner Monday to update the state’s beleaguered school funding formula. The superintendents claimed that many Illinois schools would not be able to open in the fall without proper funding. 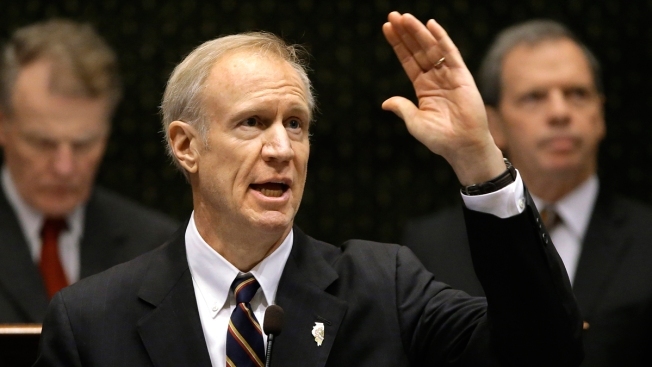 Rauner toured the state last week, pushing stopgap funding measures after the Illinois General Assembly did not pass a budget plan before the end of the spring legislative session last Tuesday.